I thought I was done writing Not chapters. But, during my editing today, I decided she needed one last hurrah. I haven’t really talked about her, or any of my characters, really (aside from Resonance’s/Spider’s blog on MySpace). She’s a prisoner of a dark magickian named Arhreton who has used her since infancy to complete monthly rituals that will bring him the power of the legendary warrior, the Middu. He tortures and torments her not only for his magickal gain, but also because the Middu is everything, and she is — Not. Not can’t speak, has no capacity for real human interaction and is a victim in every sense of the word. Her only saving grace is the ability to bi-locate — to transport her consciousness to another body in ancient Sumer, where Eight gods once ruled over humans. The interactions between the warring deities are viewed through her skewed perspective. 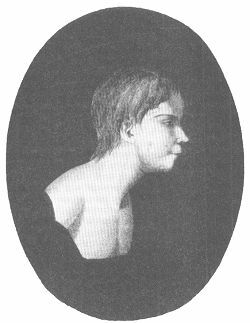 Despite the disturbing research I had to do on feral children (the photo above is of Victor, the wild boy of Aveyron), and the horrific conditions of her upbringing, she surprised me by being a fun character to write. With my other characters — even Resonance (sorry, Res) — I’m easily distracted. I get irritated because the words don’t readily flow like they do with her. I wander to the refrigerator, which is perilously close to my desk. I wander back and peck out a few more words. But with Not, I get lost. She’s tragic, funny, and sometimes fairly evil. Her thought processes waver between insightful and hopelessly jumbled. I always have to be on my toes when she’s around, because she’ll take me off on some wayward journey and once it starts, all I can do is go along, just to see where she leads me. Not was never intended to be a point-of-view character. I thought I had enough going on with three POV’s. Then I realized if I wanted to explain the gods’ back-story without the main characters having to read about them from dusty texts, I’d have to have someone experiencing their past along with them. So Not became a major player and the story of the gods was sprinkled throughout the book with more lively (if somewhat muddled) interpretation of events provided by her. The majority of the book had been written when I made this executive decision. I worried that it was the wrong choice, that I’d be spoiling an otherwise good book. Luckily for me it turned out not (small pun intended) to be the case. I feel she’s given this story a depth it previously lacked, and I hope that readers can, if not actually like her, find her interesting. If it isn’t too pretentious to say — I do. This entry was posted on Thursday, January 18th, 2007 at 10:44 pm	and posted in character, fantasy, magic, magick, novel, point-of-view. You can follow any responses to this entry through the RSS 2.0 feed. « Your Only Friend, The End. ShadowfalconI hope that didn’t make you feel bad. The whole point of Crunchy’s post was that we shouldn’t generalize or make assumptions about other cultures. I think it’s good you spoke up. Shadowfalcon, I can only hope Res lives up to your expectations.As far as the other blog, you had every right to be frustrated with some of those comments. I just didn’t want to be lumped in with all that negativity. Christina, your enthusiasm and encouragement really keep me going. Thanks so much! Avery: AMAZING! I’m so excited.The work that you put into this, I can feel your love for your characters. This sounds like something Mercedes Lackey would write. I bet once your story is released you will pick up a quick following. I’m keeping my fingers crossed for you. I’ve followed the Spider/Res blog, but this outline of the story is so powerful. I already feel for Not. I want to know what is going to happen to her. The history you put into this is worth the word count you are struggling with. I hope you didn’t take to much out.Keep us updated on this novel. Kate, thanks.Sqt, it’s much easier for me to write when I connect with my characters, as well. I’ve formed a good bond with all of mine, but for some reason, Not really draws me in. Maybe knowing there are actual children who are treated similarly is what pulls at me so much. I think it’s great that you found a character to connect with. The book will probably have a lot more depth and realism based just on that connection. I find it much easier to write when I connect with a character. I think the characters have to be real and interesting to the author in order for them to be real and interesting to a reader. Not sounds fascinating.